Cats, apart from communicating with each other, also do it with us and with animals of other species in many different ways, by meowing, purring or through body position. Cats, like other animals and humans, communicate with other individuals of their species and also with other animals in many different ways. Thus, their facial expressions and body language provide a wealth of information on their mood and their relationship with other beings. 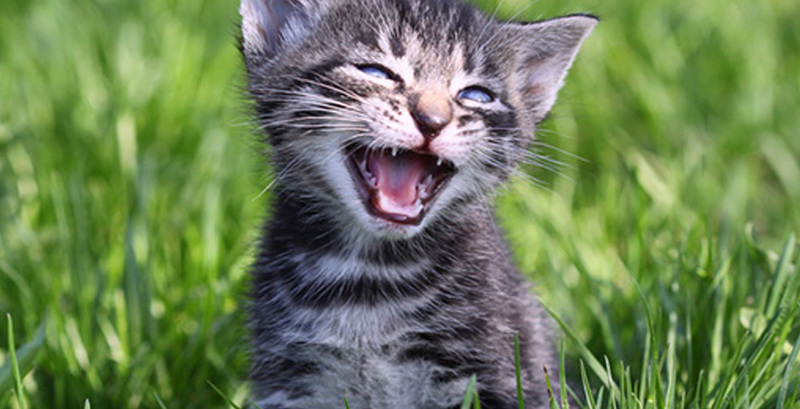 Vocalisation is another form of communication, among which are purrs, growls, and meows. Depending on the duration, intonation and intensity, there are myriad nuances in cats' meows. In fact, according to experts, each cat can emit over 60 different meows to communicate with their kind, each one with a specific meaning. So then, with a meow, cats can convey very different information to humans: either to say hello, tell us that they are hungry, say that it wants attention or that it feels unhappy for some reason. Meows vary with the mood, circumstances, and temperament of the cat and also depending on whether the meow is aimed at another cat, a different animal or its owner. Thus, we have the short and barely audible meow that is still insistent, which serves the cat to draw attention to something it needs, be it food, or having the door opened, etc. A greeting meow is usually smooth. And special mention should be made on the meow that is particular to the mating season, which is characterised by being constant, prolonged and somewhat choppy. Apparently, cats respond to vocal stimuli, and in fact they are very sensitive to sounds, so they are able, like us, to capture our moods through our tone, volume and intensity of voice, even though they do not understand our language. In this way, you can have real conversations with a cat, because the more you talk to it, the more it will 'answer'. And in this sense some breeds are more 'chatty' than others, such as the Siamese, for example. In addition to the meow, and sometimes intermingled with it, cats have other forms of communication through sound. Thus, by gurgling they greet us amicably and answer our calls. The purr, meanwhile, usually indicates satisfaction, well-being and affection, but also discomfort or dissatisfaction if accompanied by squinting eyes, especially when ill. Finally, the growl is an offensive sound by which cats express discontent and warn of possible aggression. So now, in addition to simply answering them “meow meow”, we can come to understand what they want and if the meow is addressed to us or to another animal.